With the success of all flavors of Munchkin, and the concentration over the last couple of years on resuscitating Ogre, GURPS has mostly fallen by the wayside. Once the initial corebooks were published, I have seen little other than PDF releases. PDF releases aren’t a horrible thing, but since they will never appear in your local game store, it doesn’t do much to give the perception of the game being supported… and doesn’t help build that network that sustains interest and keeps a game line going. 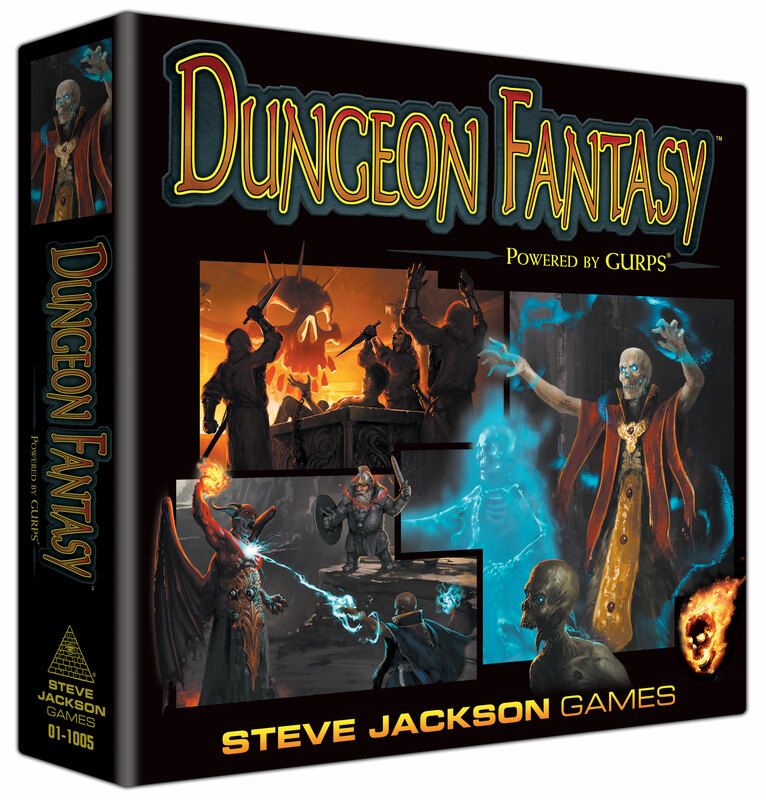 GURPS Dungeon Fantasy was a kickstarter from a couple of years ago that was, in my opinion, SJ Games’ attempt at reviving some interest in GURPS. My copy finally arrived on my doorstep last week, and it looks gorgeous. On a personal level, I’m not a big fan of boxed sets for RPGs. They take up more room, and don’t really add anything to the game itself. It’s somewhat telling that I have quite a few old school game systems where the books are in great condition, but the box itself disappeared some time ago. 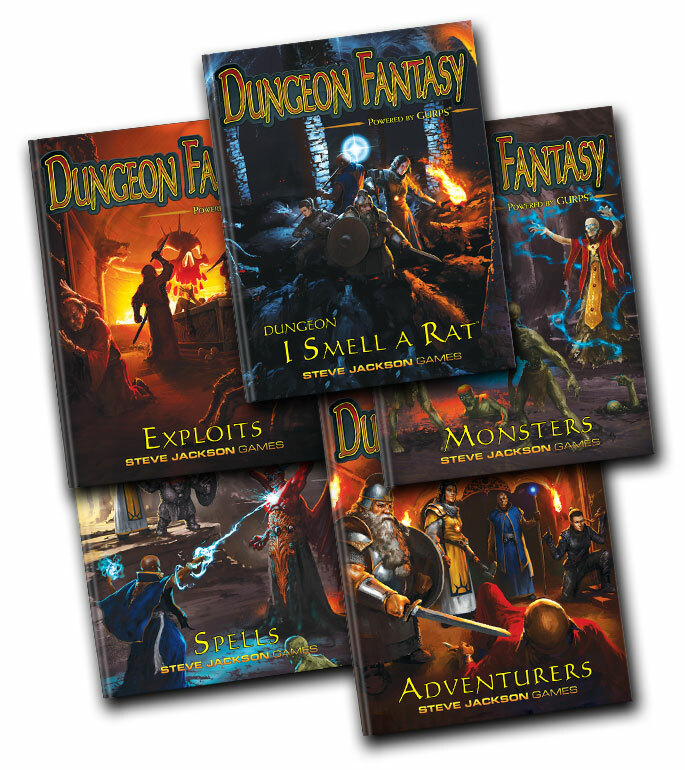 The box contains several digest-ish sized books for Adventurers, Spells, Monsters, Exploits (GM system stuff), an Adventure, and the Companion add-on (Traps, Magic Items, and another adventure). It also contains cardboard heroes (heavier stock), bases for the heroes, two battle mats, and a set of dice. I will also note that there is a large library of additional support PDFs available on Warehouse 23. These days, I am mostly running Pathfinder 3.x, but there is a special place in my heart for GURPS. GURPS and Champions (Hero) were my second generation RPGs and back in the day, I founded and was the first central mailer of All of the Above, the GURPS APA. I ran both GURPS and Champions for years, and I still probably have more Steve Jackson Games GURPS books than anything from another publisher. Note that the linked page is, to the best of my knowledge, incorrect, and that AotA is no longer being published. At first glance, it looks fantastic. So, in the coming days I will at least run a one shot of G:DF and there is a better than average chance that I’ll record and post this online for people. I’m still looking into what’s involved there. If you’re following me, and you have some experience with this sort of thing, please speak up.